Among numerous ornamental plants, human beings put more emphasis on plants that have beautiful flowers with beautiful colors, aromas and shapes; and some people even write poems such as �the horseshoes give off a sweet smell after an outing for sighting flowers�. However, in the recent years, plants with beautiful leaves stick themselves out, among which variegated leaf croton is an outstanding dark horse. Variegated leaf croton has no flamboyant flowers or tangy aromas, and is not attractive to butterflies or bees; however, with peculiar shapes, gorgeous colors and elegant leaves, it has mounted among the ranks of ornamental plants and is deeply loved by people. Nowadays, it is quite popular in the gardening areas of the southern provinces in China. 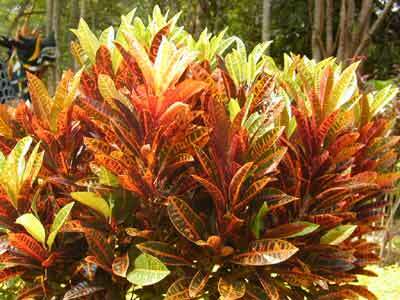 Variegated leaf croton gets its name because of the shape and color of its leaves. The shapes of its leaves are varied; some are like eggs, some are ellipse, and some are twisty. The colors of the leaves include bright green, white, gray, red, light red, deep red, purple, yellow and yellowish red etc. ; what is more, on these leaves there are various dots and specks, just like golden spots scattered on silks or colored paints on rice paper. As a matter of fact, variegated leaf croton has a big family with a lot of horticultural varieties, and they are differentiated according to the differences in the shapes and colors of their leaves. Altogether there are about 120 varieties, the most common ones including �flying swallows�, �fine yellow curls�, �threads of a weaving girl�, and �willow leaves� etc. Variegated leaf croton is easy to graft. You can graft leaves of different shapes and colors in one individual plant if you like, then you will have an ornamental plant with varied colors, exotic shapes and extraordinary appearance. If a variegated leaf croton is planted in one�s yard or on one�s terrace, it certainly will bring the person a lot of funs to appreciate its leaves of various shapes and colors.